Many Moroccan recipes use a tagine during food preparation. This makes the tagine a must have item for those who love Moroccan style food. Once you have purchased a tagine, make sure you care for it properly to extend it’s lifespan. Before you get started cooking, make sure you season your tagine. Zamouri Spices shows you how to season your tagine so you enjoy tagine dishes for a long long while. Check out the video. If you are interested in purchasing a tagine, visit Zamouri Spices to see the variety they have available. Some of us just can’t get enough of Moroccan food. Sometimes it is hard to find great recipes that are really authentic. 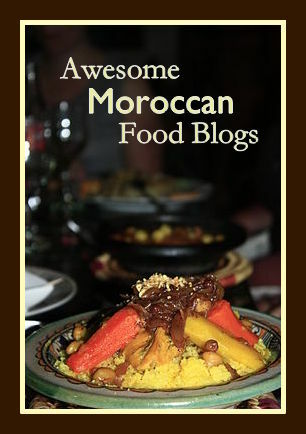 To help you out, I decided it is time to do a roundup of some awesome foodie blogs that are sure to help you cure that craving for Moroccan! Amanda, the mama behind MarocMama, blogs about travel, Moroccan culture, and of course Moroccan food. Whether you are interested in seafood, vegetarian or meat-based recipes; MarocMama has it. She has some great tangine recipes, so definitely check them out! If you are looking for Moroccan recipes, Dinners & Dreams is the place to go! Nisrine is a Moroccan American whose passion for Moroccan food is obvious. Look up recipes by season, ingredient, or even by meal. There are some nifty conversion tables and a wonderful section on ingredient substitutions. I love the recipes on this website, because they focus on real and healthy food. If you struggle with gluten issues, many of her recipes are gluten free. Christine Benlafquih shares her expertise of Moroccan cooking. Aside from the many recipes (and there are a lot of them), you will find tutorials on how to use the tagine, common recipe ingredients, as well as reviews of various cookbooks. This is a great website for someone who has not done much cooking. Some other great blogs are out there for Moroccan foodies! These websites are definitely worth a visit, as well. If you are looking for recipes in Arabic or French, in addition to English, check out Sousoukitchen. If you want some authentic recipes, the lady over at Moroccan Cuisine Marocaine posts family recipes. The Nomadic Chef has an awesome recipe section, just in case you are needing a few more! Do you know another blog or website that has great foodie information? Share it in the comments section!! Argan Oil is one of Zamouri Spices most popular items. Faithful customers love to use it in cooking and for their skin care routine. Where does Zamouri Spices Get its High Quality Argan Oil? The Argan tree grows only in a specific region of Morocco. Zamouri Spices imports its argan oil directly from Morocco and purchases it from fair trade cooperatives ran by Moroccan women. 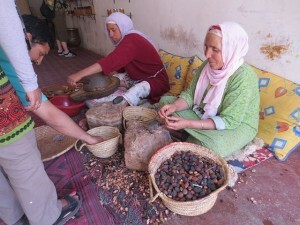 How do Argan Oil Cooperatives Produce Their Product? This is a great behind-the-scenes look at an argan cooperative that produces some of the oils sold at Zamouri Spices. It is six minutes long, but gives us an insider view of how and where the Argan Oil that we use in our kitchen and on our skin comes from.